Photo courtesy of Oily Cart. Last week we went to the Circus at the New Victory (which is still running through this weekend-- definitely try to see it if you can!) 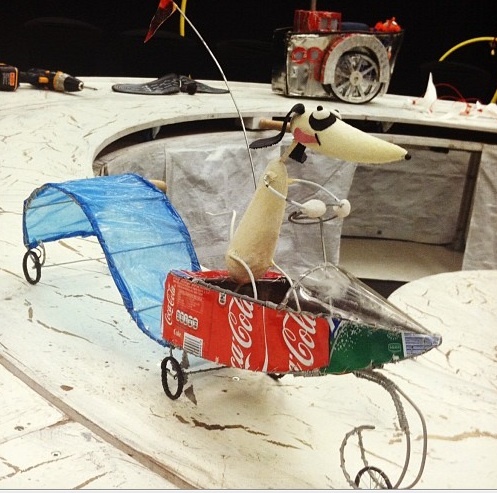 This week we are going to the New Victory to see a puppet/participatory show from England called Ring A Ding Ding. This show will run in the smaller studio space of the New Vic. Looking at their schedule online, it seems as if a lot of the shows might already be sold out, so if you are interested in seeing it, you should jump on the bandwagon now. Ring A Ding Ding is presented by London's Oily Cart Company. 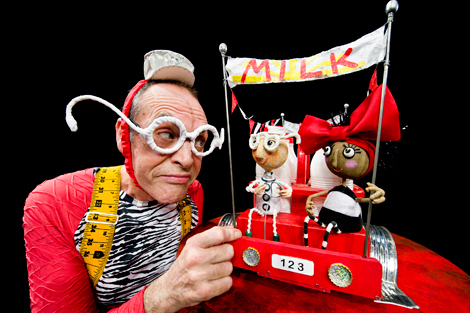 Oily Cart has been touring their unique brand of theatre primarily in the UK since 1981. Their mission is to create all sorts of shows for all sorts of kids, and they do it by creating imaginative interactive wonderlands for sets. Among their tools of the trade have been hydro-therapy pools, trampolines, aromatherapy, video projection, and of course puppets. Their shows are designed for young kids and sometimes especially designed for young people with profound and/or multiple learning disabilities. The runaway dog. Photo by Cressa Amundsen. The show they are presenting at the New Victory is designed for kids ages 2-5 and features a runaway dog, a tricycle riding heroine, a spinning table, and George the Music Man, who makes Ring A Ding Ding sing with zing. The show runs approximately 55 minutes without intermission. Tickets are $20 for non-members, $14 for members, and HIGHLY WORTHWHILE. You should see it if you can! Here's a promotional video of the show.